One of my favorite movies is Forrest Gump. Besides being one of Tom Hanks’ greatest acting roles, it’s a beautiful story of how a common man—no, a man who might have been considered a throw-away man, due to his intellectual and physical challenges—ends up being involved in extraordinary events in the last half of the 20th century. But more than that, to me, it’s about the power of love, integrity, and loyalty to transform people’s lives. It’s about how love doesn’t insulate us from pain or grief—sometimes love can even lead to pain and grief—but expecting love to do that is having the wrong focus. Love carries us through the times and changes of our lives—even pain and grief. 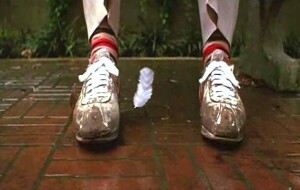 From the beginning to the end, a small white feather blows through the scenes of Forrest Gump’s life. We could spend days discussing the multiple meanings of that feather, and about all the meanings of this wonderful film, but for now the thing about that feather that resonates with me is its reminder that often little things can be overlooked, and yet they end up being present at so many important things. Forrest's ability to be present in the moment is a great gift of his. Being present—being alert and awake to what is going on around us right now—I am convinced is one of the great lessons of Advent. In a time when our identity and sense of self-worth is wrapped far too tightly around what we do or who we know, Advent reminds us that simply BEING is perhaps even more important. And Forrest Gump is a great example of that, too. Furthermore, Forrest demonstrates the effect that fidelity—that old fashioned word that means more than simply keeping promises-- have as the bedrock foundation of a person’s life. The movie shows Forrest, even though he was from humble circumstances and had to overcome a lot of obstacles both physically and mentally, being involved tangentially in a number of the most important events of the last part of the 20th century. He meets Elvis when Elvis was still just a truck driver. He meets presidents. He goes to war in Vietnam. He loves greatly—and loses some of the people he most loves. And yet he perseveres. Just like all of us. The events flash past, seemingly disconnected. And that reminded me of the characters we have been hearing about in our lectionary the last few weeks—there have been a dizzying array, and many of them seem to not be obviously linked, they’ve whirled by so fast. We missed out on the story of Ruth when we celebrated St. Martin’s Day, and that’s a shame, because her story is one of my favorites. And then we heard about Hannah, and her longing to have a child was so strong that she promised God to give the baby right back to God’s service if only she could have one and take care of it until it was weaned. This week, we get the introduction of another character who is important to the overall narrative of scripture. 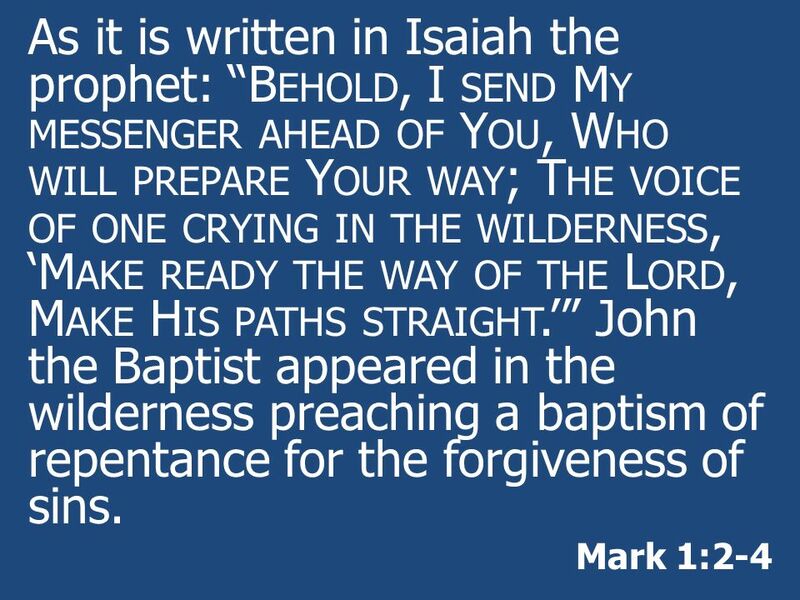 This week we get the arrival of John the Baptist. Like Forrest Gump, though, John could easily have been an insignificant character from an insignificant place. He certainly doesn’t seem positioned to make a big impression on the powerful or the mighty. Far from being a common man, he seems to be downright weird. He’s a familiar character to most of us, in our mind’s eye: a wild-haired, wild-eyed man dressed in camel’s hair, which had to be pretty itchy, one would imagine, with a belt around his waist, known for eating a diet of grasshoppers and wild honey—which always makes me wonder if he flossed or brushed his teeth because that just sounds like a dental hygiene nightmare, you know? And that’s also my way of distracting myself from the fact that he ate bugs. 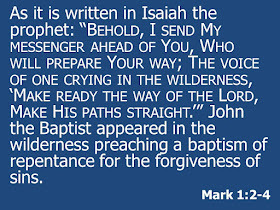 From the stories we get about him, he kept to the wilderness near the Jordan river, because the Jordan was necessary for the baptisms he offered to people. His message could be harsh and abrasive—and yet it seems that people flocked to hear him anyway. But we don’t hear that part of him this week. Instead, we are reminded that John started out as a longed- for baby born to parents who were thought to be too old. And he’s a baby boy whose life will be intertwined with another baby boy born not too long after his own birth. Our gospel today starts with an illustrious list of names—powerful men who were wealthy, connected, whether they were Romans or of Jewish descent. And into this middle of this "Who’s Who in Ancient Palestine" comes a nobody—John, son of Zechariah—and even the fact that he was Zechariah’s son was improbable, for John had been born to Zechariah and his wife Elizabeth when both were considered to be far too old to be having babies. And when his father, Zechariah, is told by the archangel Gabriel that there will be a baby boy coming to his wife and himself, Zechariah just can’t believe it. And even though if you know anything about scripture, you know that that is often the reception that angels get when they start announcing improbable births, for some reason Zechariah’s skepticism rubs Gabriel the wrong way, and so Zechariah becomes mute for the duration of his wife’s improbable pregnancy. Once the baby was born, there was a lot of talk about what his name would be. It seemed like all their neighbors had an opinion. But Gabriel had already told Zechariah to name the baby John, and Zechariah was NOT about to anger Gabriel twice, so he wrote on a tablet that the baby’s name was John, which is what Elizabeth his wife had been saying all along. The second this was made clear, Zechariah’s ability to speak was restored, and he wasted no time in using his restored voice to praise God loudly and fervently. A voice crying out in the wilderness…. Leveling out any obstacle, whether mountain or valley, that might stand between the Messiah and the broadcasting his message of salvation. Now, that’s an amazing claim. How does John plan to prepare the way for Jesus to save us? By calling God’s people to repentance to turning around their focus and priorities, not half-heartedly, but decisively. What the ancient Greeks called metanoia-- a decisive changing not just of the mind but of the heart, so that we experience reality in a different way. For John’s ministry is meant to prepare us for Jesus’s ministry. They complement each other. John’s radical pronouncements of condemnation and demand for repentance reminds us that Jesus’s message of reconciliation, healing, and forgiveness doesn’t come cheaply. Jesus comes to restore creation to its proper beauty and balance, but that same beautiful vision meets resistance from the powers of the world that thrive on oppression, division, fear, and chaos. Reconciliation cannot happen unless we own up to and repent—renounce, even-- all that we have done to harm our relationships with the earth, with each other, and with God. Mercy forgives, but in forgiving, there is inevitably judgment. As the Rev. Becca Stevens says, love heals, but in order to heal love also has to reveal the places where there is woundedness and brokenness. It is this kind of preparation that Advent calls us to make. Starting inside of ourselves. Making what is crooked straight, setting what is turbulent at peace, and turn our focus so that it rests outside ourselves. Changing our emphasis from doing Christianity to being Christians within the same flesh and bones that God sanctified by sending his Son to be one of us. Yet that’s what we’re preparing for. Salvation WILL be visible to us, because it is coming in the form of a little, helpless baby, born in the middle of nowhere to parents who are nobodies, too. A little baby who shows us the spark of God inside us all, grounded in love, in promises made and kept, in fidelity, peace, integrity and wholeness—what our Jewish friends call shalom. The feather blowing through the Bible is this truth: it is from the unexpected places that great prophets, leaders, and teacher arise. It is from the most humble of parents and circumstances that a Savior will be born. We profess him to be God incarnate, in human form and experience, just like you and me, sent to show us how to recover our full humanity, how to BE fully human in celebrating our being made in the image of God. It’s easy for us to get distracted from that. It’s easy for us to get dragged down by the weight of alienation and fear that fills up so much of our existence today-- fear and isolation that pulls us away from realizing that love is why we are made. Forrest Gump, in all his simplicity, embodies this truth that Jesus teaches us. Like Forrest Gump’s feather, love is the thread that runs through our lives, and calls us back to valuing being over doing. Of being present in this moment, this time of waiting and preparation, centering ourselves to joyfully proclaim the promises of God being fulfilled in our lives every day, starting in the most unlikely of places.